When Size Zero – referring to women’s dress Size 0– was the trend for young women to follow, there was a huge controversy over the health implications this involved. Size Zero is the equivalent of dress size 4 in the UK. It means 31.5 inches for the bust and hips, and 23 inches for the waist, that is 80cm and 60cm respectively. This is the average size of an 8-year-old girl, but just a few years ago, it was the “ideal” size for a young model whose ambition was to feature on the cover of fashion magazines or take part in famous designers’ fashion shows. After the death of several young models and the barring of such anorexic, underweight girls from fashion shows, sanity seems to have started overtaking vanity. What Exactly Is the Size Zero Diet Pill? The Size Zero Pill was not manufactured to be used as a slimming Tablet, but to help horses with breathing problems like asthma or pulmonary diseases. The pill consists 100% of chemical substances, and it was meant to be used for an animal which is about three or four times the size of an average human. Size 0 Pill works by raising the body temperature and the heart rate. When the heart rate is increased, the blood circulates faster and this makes fat burn easily. There have been several testimonials of young women who experienced a dramatic weight loss in a short time, but they also experienced severe side effects. However, what seems to be a positive result is in fact a serious health hazard because of the numerous, even fatal side effects of the product. How Effective Is Size Zero Pill? Women who have used the Size 0 Pill refer that apart from suffering serious side effects, they put back on the weight they had lost after stopping using it, and after the last trace of Clenbuterol had left their body. If you want to see how effective this pill is, just have a look at the picture of the emaciated model above. If you want your body to look like this, then this is the most effective diet pill you can choose. And you will save your family enough money as they will have to pay much less for your tiny coffin. The main ingredient of Size Zero Pills is Clenbuterol, which is a substance not meant for human consumption. It was first used to treat horses with breathing problems, and it was also used as a prescription drug for the treatment of ADHD (Attention-Deficit Hyperactivity-Disorder). Size Zero Pills – Clenbuterol can be fatal to humans. They can cause dizziness, palpitations, panic and anxiety attacks, and because it makes the walls of the heart stiffen, it can cause heart attacks or strokes which can lead to death. It is a pill you should never consider taking. You may lose weight but you can also lose your life. Should It Be Used or Not? Clenbuterol may be approved by the FDA, but it’s approved for animal not human use. Under no circumstances should you use these pills. Both your health and your life will be at risk. Definitely not recommended. Clenbuterol, Size Zero Pill active ingredient, may be FDA approved, but it is mainly used in animal products. It’s not proper for human consumption. 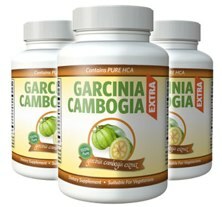 Garcinia Cambogia – a completely natural dual fat burner and appetite suppressant. Garcinia Cambogia can prevent the ingestion of fat from foods that contain a high fat content and also help to burn the excess fat that already exists.